When you are asked to premiere the teaser poster for the next film from a Berlinale Golden Bear winner, you say yes! 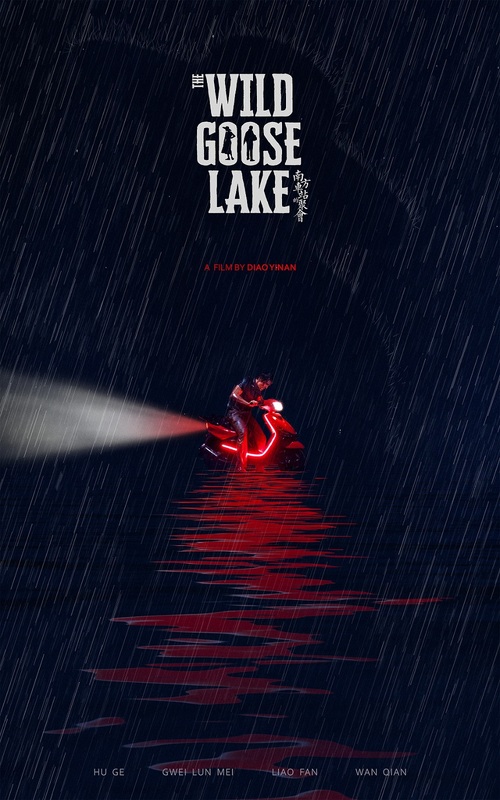 ScreenAnarchy is pleased to help premiere the teaser poster for The Wild Goose Lake, the new film from Chinese director Diao Yinan (Black Coal, Thin Ice and Night Train). A bleak, yet engrossing whodunnit set in the wintry climes of Northern China. Black Coal, Thin Ice is also the latest in a series of high profile yet independently spirited Chinese films to embrace crime genre sensibilities, while addressing socio-economic issues in contemporary China. The Wild Goose Lake is now in post production and the write up below promises more of same gritty crime genre goodness. The teaser poster itself features a bloodied and drenched Hu Ge who, by all appearances, is struggling to get a tricked out moped going. The subtle silhouette of a woman can be seen in the rain around him. He … the leader of a dangerous bikers gang. She … a prostitute willing to give everything to get her freedom back. They meet each other while he’s on the run, escaping the bloody gang war that shakes his entourage. Both in a dead end, they get along and understand each other. Together, they are willing to play one last time, and gamble their destiny. A train station in South China. The Wild Goose Lake stars Hu Ge (1911), Kwai Lun Mei (Flying Swords of Dragon Gate), Liao Fan (Silver Bear Award Winner for Black Coal, Thin Ice) and Wan Qian.